There’s nowhere else in the world quite like it. You can’t help but be blown away by the number of solar panels gleaming from almost every surface in the city. From the top of its buildings to the roof of its buses. Dezhou, China is the world’s first solar city, with 98% of its power produced by solar energy. It’s inspiration of Chinese entrepreneur Huang Ming. China Icons got the guided tour from one of his engineers Ni Weiyue. Thanks to dreaming big, being innovative and leading by example, Dezhou has replaced 600,000 tons of coal a year with green technologies and energy. Meet Huang Ming, solar energy pioneer behind China's ambitious, record breaking Solar Valley - where 98% of energy used in the city of De Zhou, comes from solar energy. Could this be the model for future cities across the world? When Huang Ming saw the damage caused by pollution in his home town, he was devastated. That, followed by the birth of his daughter soon after, inspired him to quit his day job and dedicate his life and bank balance to solar energy research. Today, the company Huang Ming founded - Himin - has become one of the world's most successful solar energy companies. Huang Ming takes us on a personalised tour of his city and the inspiration behind his favourite buildings - the Sun and Moon Mansion and the factories topped with solar panels. He also reveals some of the research and development Himin are doing to introduce solar power into everyday items used across the world. Half of China's population now use solar energy and the country makes the most solar heaters and panels in the world. But with this adding up to just 1% of the world's energy consumption, Huang Ming believes there's so much more still to be done. Chongqing, Chinese mega city that reminds us on Manhattan might get impressive new complex, right between the Yangtze and Jialing rivers. Architects from an international architecture firm Safdie Architects designed this huge piece of modern architecture, a mixed-use complex of skyscrapers for the point where two rivers meet. Two central towers should be 358m (1,175ft) tall while the shorter ones should be 248m (814ft). Huge platform will connect all four towers offering space for rooftop gardens, clubs and pools. 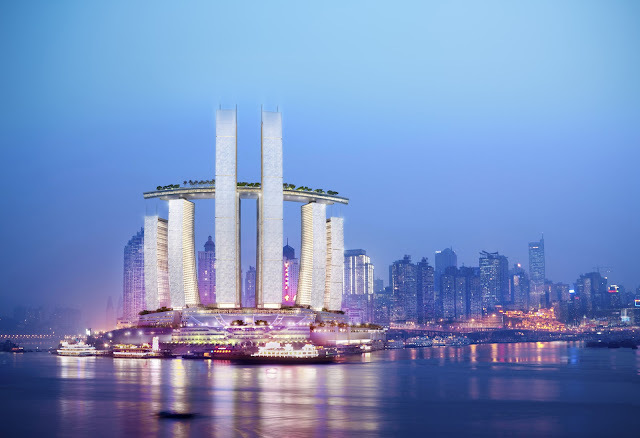 "Located at the confluence of the Yangtze and Jailing rivers, the site for this mixed-use project is imbued with a significance that is immediately symbolic. The foremost of Chongqing’s traditional city gates (the Chaotian Gate, or “gate to heaven”), where emperors carried out the ceremonies of diplomatic greeting, it has long been a historical landmark... MORE PLS CLICK HERE. China wants to build 100 panda-shaped solar power plants. They've already built one and have begun another. From the air, the collection of panels looks just like a cartoon panda. Each individual plant will, over a 25-year period, save 1.06 million tonnes of coal and cut greenhouse gas emissions by 2.74 million tonnes.